The Bangladeshi parliament has overturned a 15-year-old requirement that general elections are overseen by non-partisan caretaker governments. The system was introduced in the mid-1990s in an effort to end violence and fraud that often marred voting. The opposition has denounced the move, arguing that it could allow incumbent administrations to rig future votes. Prime Minister Sheikh Hasina was highly critical of the last military-backed caretaker government of 2006-8. She said that it was wrong that it stayed beyond its mandated three months and delayed voting by about two years. 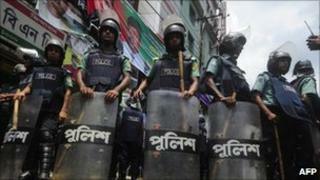 Sheikh Hasina denied that the move is designed to allow her government to rig the next vote. "This is a historic moment for democracy," she told parliament after the vote. "We can't allow unelected people to oversee national elections." But opposition lawmakers vowed to protest against the move by a continuing series of general strikes and street protests which began earlier this month. "This will not be good for the future of our democracy," said independent deputy Fazle Azim. Under the arrangement, a caretaker authority of technocrats stayed in office for 90 days, mandated to organise the election and transfer power to the newly elected government within that timeframe. The last caretaker government attempted to control corruption by sending hundreds of politicians - including Sheikh Hasina and Khaleda Zia - to jail on charges of abusing power and illegally amassing wealth. The pair were released before the December 2008 election, along with the scores of other politicians who were detained. The next election is not due before the end of 2013.